It started as a cult hit. Then came widespread fame, the lure of a major label, a creative split, accusations of selling out, and finally the break-up. It's fitting that the story of Guitar Hero sounds like it came straight out of the biography of a rock band. The video game franchise was a rare bright spot for the music industry. But with Activision Blizzard's announcement that it will close the unit that makes Guitar Hero, it feels like the end of an era. The idea behind the game is so logical it's a surprise it didn't happen sooner. It tapped into a few key concepts that other games had skirted around, but never fully realised. The Controller: The original Guitar Hero controller was a miniature version of a real guitar, the Gibson SG. It'd be a stretch to say it felt real, but it felt enough like a guitar to make you feel less like you were playing a game and more like you were playing a song. The Urge to Perform: We've all played air guitar, right? This is like playing air guitar... for real. You're holding a (semi) real guitar, and your (semi) real strums are being turned into (semi) real musical notes. The Soundtrack: But of course, none of this works without the music. Before Guitar Hero, music games were made in Japan... which meant soundtracks full of Japanese songs. Great for Japan, not for the rest of the world. Guitar Hero had a proper rock soundtrack spanning classics like Smoke on the Water to more current hits like Take Me Out. The combination of those elements turned the original Guitar Hero into a surprise hit. A sequel quickly followed. But then came two things that sowed the seeds of the franchise's eventual demise. Activision, the world's biggest video game publisher, bought Guitar Hero. 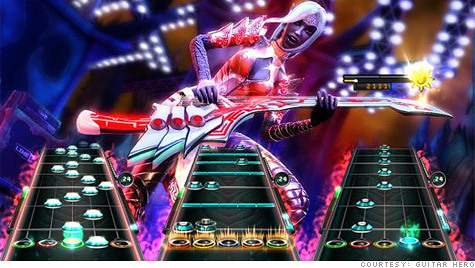 And Harmonix, the original developer of the first two Guitar Hero games, were bought by MTV. Harmonix used their new position to unveil a new franchise: Rock Band. Instead of being just a guitar game, Rock Band would allow four players to play together: A lead guitarist, a bass guitarist, a drummer and a singer. At first, it didn't seem to matter. Rock Band was more innovative, but it was comprehensively out-sold by the next Guitar Hero. Activision sold over 1.5 million copies of Guitar Hero III in the first month alone - and claims it is the first time a single video game made over a billion dollars. 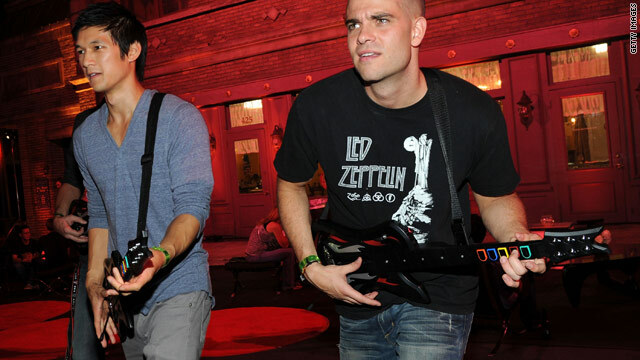 Between Rock Band and Guitar Hero, the music game reached its peak. The games were a mainstream phenomenon. Plastic guitars appeared everywhere from frat parties to adult living rooms. Music games were so successful that they even caught the eye of the most popular band in the history of music: The Beatles decided to make their digital debuts not on iTunes, but in a game. By the time The Beatles: Rock Band was released, the market for music games had changed. And analysts and critics put part of the blame on Activision for releasing too many Guitar Hero games, too quickly. In 2009 they released five different games with the Guitar Hero name - and that's not including spin-offs DJ Hero and Band Hero. In the end, the overwhelming flood caused consumers to tune out of music games, forcing Activision to give Guitar Hero the axe. But don't count out the franchise for good. What's more rock n' roll than a comeback tour?